Plzeň Region (Czech: Plzeňský kraj) is an administrative unit (kraj) in the western part of Bohemia in the Czech Republic. It is named after its capital Plzeň (English Pilsen, German: Pilsen). In terms of area, Plzeň region is 7,561 km², the third largest region in the Czech Republic. However, the population of 572,459 inhabitants (as of 31 December 2012) it is the ninth most populous region. After the South Bohemian Region it is the second least densely populated region. The region can be roughly divided into two parts: a highly industrialized north-eastern part with a strong engineering tradition around Pilsen (Czech: Plzeň) and a more hilly and rural south-western part with smaller-sized manufacturing companies processing natural resources. The region borders the Karlovy Vary Region (to the north-west), Ústí nad Labem Region (to the north), Central Bohemian Region (north-east), South Bohemian Region (to the east) and with Bavaria (part of Germany) in the south-west and west. The region was established based on the constitutional lax No. 347/97 of Collections concerning the formation of higher territorial administrative units. The region and its authorities are specified by Act No. 129/2000 of Collections concerning regions, which came into effect on the day of the regional authorities elections, or on January 1, 2001. The districts still exist as regional units though most administration has been shifted to the Municipalities with Extended Competence and the Municipalities with Commissioned Local Authority. The total population of the region in December 2012 was 572,459 inhabitants. 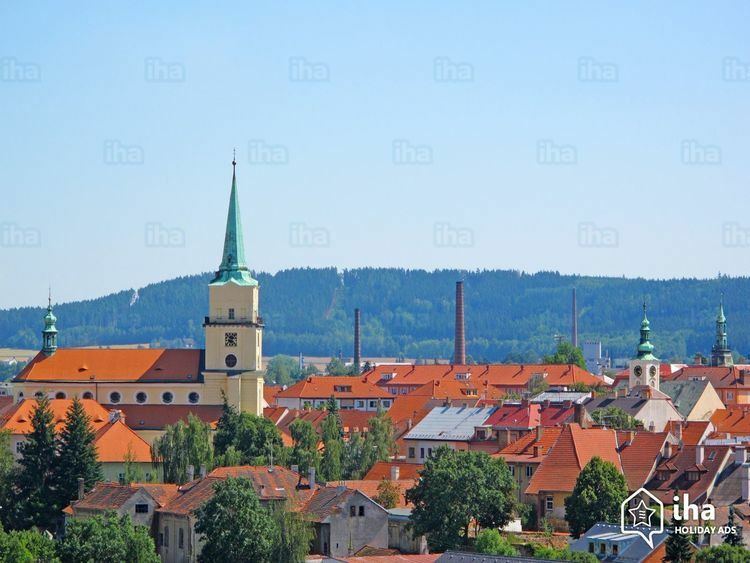 More than 30% of the inhabitants reside in Plzeň which is the fourth largest city in the Czech Republic with 167 thousand inhabitants. Plzeň is the largest city in the region. There are 56 towns in the region, which account for 67% of the total population. More than 30% of the population lives in municipalities with less than 2000 inhabitants. The Plzeň Region is the third least densely populated region in the Czech Republic. The population density is 75.6 inhabitants per km² while the national average is 133.2 inhabitants per km². The least populated parts of the region are Tachov District (38.5 inhabitants per km²) and Klatovy District (45.0 inhabitants per km²). Regarding age distribution of population, the Region ranks among the oldest in the Czech Republic. The average age of inhabitants of the Plzeň Region was in 2011 41.5 years. In the south-eastern part of the region we can find a range of mountains Šumava and the Bohemian Forest (Czech: Český les). The capital Plzeň is surrounded by Plzeň Basin. The rest of the region is occupied by highlands, namely Plzeň Highlands and Brdy Highlands. The largest part of the region belongs to the drainage basin of Berounka river. The southern part of the region belongs to the drainage basin of Otava River. The agricultural land covers 50.2% of the total area of the region, where 67.9% is arable land. Forests cover 39.7% of the total region’s area, with higher proportions of forests can be found especially in Šumava, Brdy Highlands and the Bohemian Forest. There are raw material resources on the region`s territory, such as coal, heat-resistant and ceramic clays, and building stone limestone. The conditions for farming are quite favourable as well. The climate of the region is influenced by the western and south-western winds from the Atlantic Ocean, which bring the largest part of the regional precipitation. The climate varies considerably within the region. The warmest part of the region is in the Plzeň Basin. Plzeň Region is average in economic development when compared to the rest of the Czech Republic. In 2011, the region produced 4.8% of the national GDP. The region's total GDP was CZK 186.6 billion (EUR 7.3 billion) and per capita GDP was CZK 325,753 which was the third highest regional result. The most significant sectors in the region are engineering, food processing, building materials industry, ceramics industry, energy production and metallurgy. In 2010 there were 207,000 people employed in the region, accounting for 36% of the total population. In 2011, the business sector in the Plzeň Region comprised 147,000 entities, the majority of which were sole traders. 40% of all economic subjects were based in Pilsen area. The average wage in the region in September 2013 was CZK 23,105 (approximately EUR 905). Compared to other Czech regions, the Plzeň Region has a relatively low level of unemployment (6.07% as of September 2013). The most significant engineering company in the region is supposedly Škoda Machine Tool a.s. producing for example milling and boring machines, centre lathes, turntables, etc. Other important industrial companies are DIOSS Nýřany a.s. (accumulators and batteries), Okula Nýrsko a.s. (processing of plastics) and Lasselsberger s.r.o (ceramics industry). A number of foreign investors based their establishments in the region in the recent decades, namely Panasonic AVC Networks Czech s.r.o. (flat screen displays production), Yazaki Wiring Technologies Czech s.r.o (components for automobile industry), Vishay Electronic s.r.o. (production of electric components), Borgers Cs spol. s.r.o. (plastic products), etc. The road network of the region consists of 5,129 km of road, whereof 109 km are motorways. The main motorway in the region is the D5 motorway connecting Plzeň with Prague and Germany. As of January 1, 2011 there was 711 km of railways. Compared to the rest of the Czech Republic, the quality of the environment may be regarded as good. Specific emissions in the region are lower than the national average. The least damaged areas comprise the mountainous parts of Šumava, the Bohemian Forest, western parts of Brdy Highlands, and the areas surrounding the municipalities of Manětín and Nečtiny. The protection of the environment in Šumava has been ensured by the establishment of Šumava National Park and the Šumava Landscape Protected Area. In 2005, the Protected Landscape Area Bohemian Forest was newly designated. There are 182 small protected areas in the Region and several wildlife parks have been designated to conserve the landscape variability. On the other hand, the environment is severely damaged in Plzeň. Specific emissions reported for the Plzeň-City District are several times above the national average. Plzeň and its surroundings suffer from heavy road traffic and high concentration of industrial activities. The traffic worsens quality of the environment by emissions (nitrogen oxides, hydrocarbons) and noise. Moreover, the areas surrounding the municipalities Nýřany, Tlučná, Vejprnice, Břasy, Radnice, Stříbro and Ejpovice were affected by mining or quarrying activities. Since 1993, Domažlice District, Klatovy District and Tachov District have been using the European support programme of the cross-border cooperation. The municipalities in the border areas of the Czech Republic and Germany form two Euroregions: the Bohemian Forest- the Bavarian Forest–Mühlveiertel and Egrensis. Cross-border co-operation with Bavaria on the Euroregional basis helps moderate social-economic differences. the water castle at Švihov. Also the town of Domažlice and its traditional summer Chod Festival attract attention of many visitors.